Looking for a simple side dish that your kids will love? Have a picky eater that thinks veggies are evil? Try my Cheesy Cauliflower that is a proven winner with my kids and I’m sure yours will love this side dish too. My two boys couldn’t be more different nutrition wise. If you set a bowl of fruit and a cookie in from of my 10-year-old he would always choose the fruit. He likes to generally eat healthily and only complains when I serve green beans or Brussels sprouts. My 3-year-old, on the other hand, could sniff out a sugar-laden treat from 10 miles away. Most days it’s a struggle to get a banana down him for breakfast unless I make my Swedish Pancakes with Brown Sugar Bananas, but even then it’s a struggle. So I make small concessions and try my very best to make good things as appealing as possible. And this Cheesy Cauliflower is a hit with both my boys. Start by chopping the core off the cauliflower and chop into similar sizes. Add to a pot of water and set to boil for 15 minutes. Remove the cooked cauliflower from the pot and drain the water. To that pot add the butter and cook over medium heat to melt. Once melted whisk the flour 1 Tablespoon at a time and stir to combine. Now add the milk and continue to whisk until it starts thickening. Now it’s time to add the spices. Four simple ingredients: salt, pepper, garlic powder then Parmesan. I love the powder kind and use it constantly. Now the fifth spice is really what makes this dish a stand out~nutmeg. A few years back I was watching The Rachel Ray Show and she recommended adding nutmeg to cheese sauces. Ever since then that is what I’ve done. Who am I to question Rachel Ray! Once you’ve added the spices and Parmesan whisk to combine then add 1/2 cup of the cheddar cheese and stir until melted and combined completely. Add the cauliflower back into the pot and stir the sauce and cauliflower so that it covers every piece. Put the cauliflower into a greased oven proof bowl then sprinkle with the reminding 1/4 cup cheddar cheese. Put into a 350 degree preheated oven for 15 minutes. As always thank you to our Sunday Supper host this week, Anne from Simple and Savory. If you want more vegetable recipes to make kids happy check out all these other recipes from Sunday Supper bloggers. Tender cauliflower is combined with a creamy cheese sauce. Cheesy Cauliflower is a veggie side dish that is kid approved. Start by chopping the core off the cauliflower and chop into similar sizes. Add to a pot of water and set to boil for 15 minutes. Remove the cooked cauliflower from the pot and drain the water. To that pot add the butter and cook over medium heat to melt. Once melted whisk the flour 1 Tablespoon at a time and stir to combine. Now add the milk and continue to whisk until it starts thickening. Now add salt, pepper, garlic powder, nutmeg then Parmesan. Once you've added the spices and Parmesan whisk to combine then add 1/2 cup of the cheddar cheese and stir until melted and combined completely. Put into a 350 degree preheated oven for 15 minutes. Enjoy! Did you know that May is National Burger Month? One of my earliest memories involved a burger and a pretty funny story from my childhood. My Dad loves to cook on the grill. One day he made burgers and I did not like it so I fed it to…my dog. Needless to say, he was not happy. I should have felt bad but the dog looked so happy so I think I remember it being worth it. As an adult though I am a HUGE burger lover. This includes one that I make in my new favorite kitchen essential, the cast iron pan. 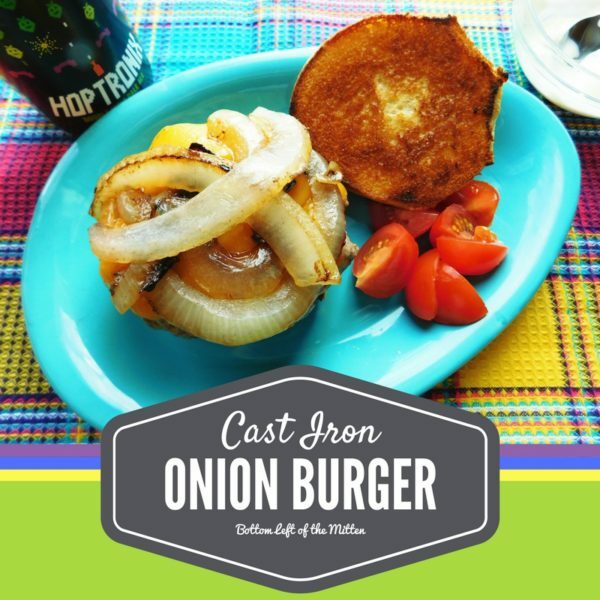 That’s why I call these cast iron onion burgers. This Mitten Movie Night is kicking off Season 3 of Unbreakable Kimmy Schmidt. With these burgers, we’re drinking some Hoptronix from New Holland. Do you agree that hops go with everything? I think my husband would because they are his favorite types of beer. Now on to the cast iron onion burgers. Let’s start with the patties. 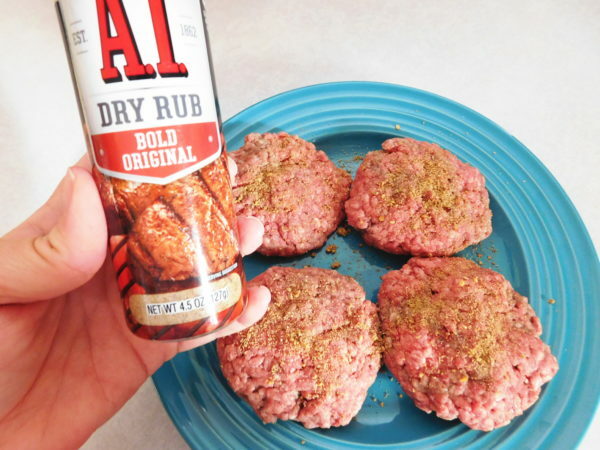 Take the ground hamburger and add Worcestershire Sauce, A1 Sauce, salt and pepper and mix. Form into 4 burgers. Shake the dry rub on top, this makes a nice little flavor crust when cooked in the cast iron skillet. Place the cast iron skillet on the stove top and heat on medium/high for 3-4 minutes to get it good and hot. Add oil to the pan. 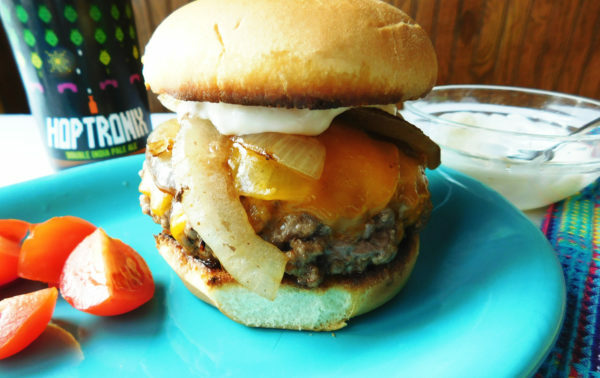 Place onions let sizzle for a few seconds then place burger on top. To cook the burger as evenly as possible cover with a lid. I got my pan as a set through Walmart the Pioneer Woman collection and the top fits great. Cook 8 minutes, that was the ‘sweet spot’ on medium heat for these cast iron onion burgers. Now flip over the burger so the onions are on top. Cook 6 minutes. Add cheese then cover again and cook an additional 2-3 minutes to melt. Check the center for the desired coloring. I like my burgers cooked all the way through so the times stated above are what I used. Please Note: Check your pan and stove directions to make sure that you do not consume undercooked meat. For any burger or sandwich, a toasted bun is a must! Take the buns and smother in some butter and cook on a sheet pan for around 5 minutes. Now it’s sauce time! I just whipped together mayonnaise and horseradish sauce. Top the toasted bun with the burger. Smother as much as you like the sauce on the bun. And here you are….. 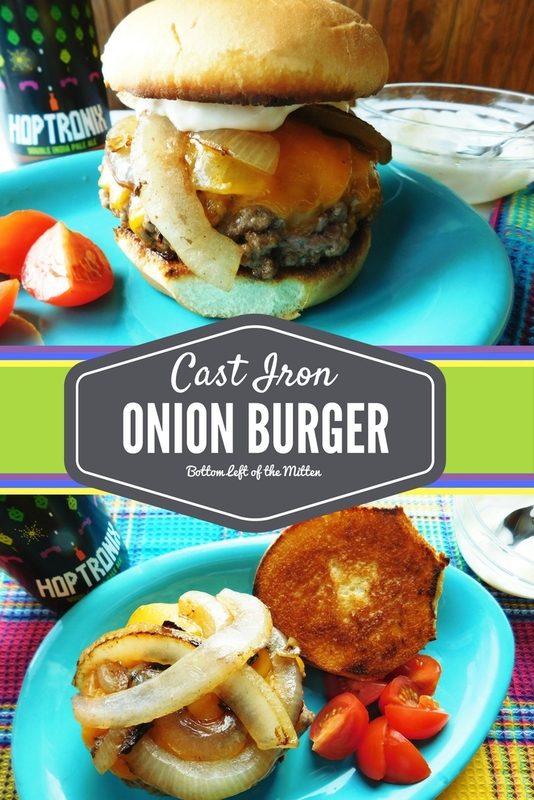 These cast iron onion burgers are so juicy! 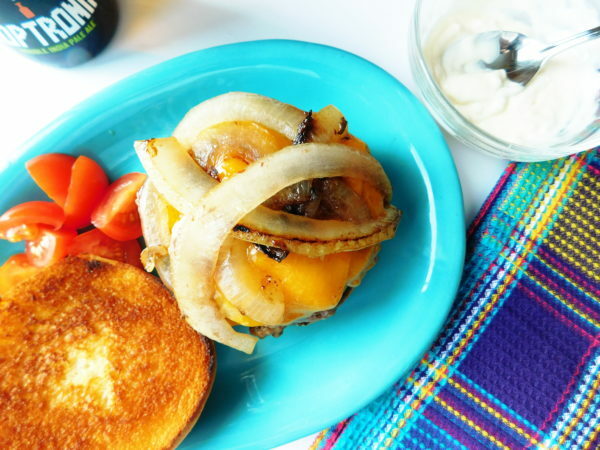 Topped with melted cheese, horseradish sauce and onions, this is one burger recipe you won't want to miss. Take the ground hamburger and add Worcestershire Sauce, A1 Sauce, salt and pepper and mix. Form into 4 patties. Shake the dry rub on top. Place the cast iron skillet on the stove top and heat on medium/high for 3-4 minutes to get it good and hot. Add oil to the pan. 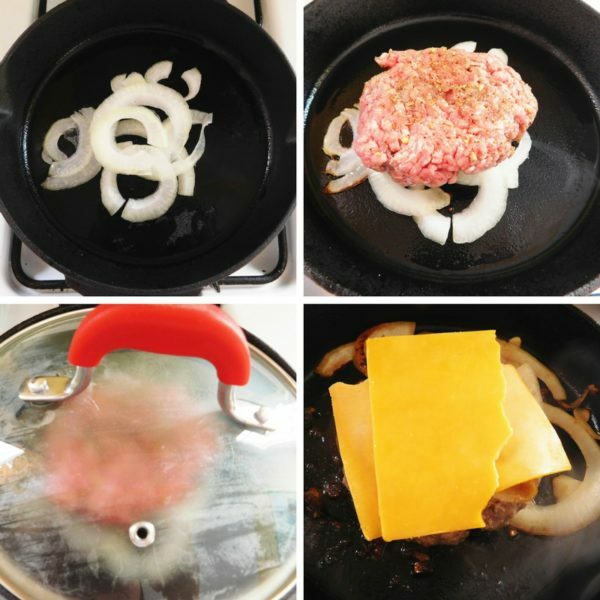 Place onions let sizzle for a few seconds then place burger on top. To cook the burger as evenly as possible cover with a lid. Cook 8 minutes, that was the 'sweet spot' on medium heat. Flip over so the onions are on top. Cook 6 minutes. Add cheese then cover again and cook an additional 2-3 minutes to melt. Take the buns and smother in some butter and cook on a sheet pan for around 5 minutes. Whip together mayonnaise and horseradish sauce. Top the toasted bun with the burger. Smother as much as you like of the sauce on the bun. Enjoy!